There is a new wave of research bringing attention to risk and complication in surgeries performed for shoulder instability. Below we will highlight studies which are calling into question certain treatments including physical therapy for the patient with shoulder instability. We will also highlight non-surgical options that could strengthen the shoulder capsule. Before continuing, if you have a question about shoulder instability, you can get help and information from our Caring Medical staff. The main cause of chronic shoulder dislocations are chronic shoulder dislocations. This is not a play on words, treat and cure the chronic shoulder dislocation and you prevent future dislocations. Patients need to be made aware that in first time dislocations there is usually enough trauma and significant soft tissue damage that future and chronic instability and dislocations and a long medical history of shoulder problems will occur. Anterior shoulder dislocation occurs in approximately 95 percent of all shoulder dislocation cases. In this dislocation, the anterior static shoulder stabilizers, including the anterior capsule and the inferior glenohumeral ligament, are torn away from the bone. In some cases a chip of bone from the posterolateral aspect (Hill-Sachs lesion) of the humeral head (ball) or a torn rim (Bankart lesion) of the glenoid (socket) may occur. It demonstrates an alarming number of athletes who are unable to continue their sport without further dislocation or the need for surgery. This also does not address the percentage of athletes who do have surgery and return to their sport. Recurrent anterior shoulder dislocation and instability is sometimes associated with an ALPSA (anterior labroligamentous periosteal sleeve avulsion) lesion or labral tear. The difference between a Bankart lesion and ALPSA lesion is that both have labrum displacement, in the ALPSA lesion the anterior scapular periosteum (the membrane covering the bones which contain fibroblasts and osteoblasts – healing and building cells of cartilage and bone) tears off as well allowing the labroligamentous (the labrum, ligaments and connective tissue) structures to also be displaced. People with ALPSA tears tend to have a high number of recurrent dislocations, because of the instability and weakness of the anterior inferior glenohumeral ligament. ALPSA tears are also associated with larger sized Hill-Sachs lesions. Those with ALPSA tears not only suffer from recurrent dislocations, but high surgical failure rates. Arthroscopic ALPSA repair failure is quite high compared to repair of Bankart lesions. In a study comparing ALPSA lesions with Bankart lesions and postoperative recurrence rates after arthroscopic capsulolabral repair- the ALPSA group had more than double the recurrence rate. In addition, according to a study from researchers in South Korea, the ALPSA group presented significant postoperative loss of external rotation after capsulolabral repair. (2) The obvious choice for ALPSA lesion treatment and repair of the tears is Prolotherapy rather than surgery. While surgery can treat the anterior dislocation effectively in certain types of lesions, post-operative pain, lengthy rehabilitation, and a chance of not returning to a previous level of activity, work or sports participation are reasons to consider Prolotherapy as an alternative to standard treatment approaches. Prolotherapy injections directed at the anterior shoulder capsule and the insertions of the middle and inferior glenohumeral ligaments will increase joint strength and allow pain-free motion through the wide range of movement in overhead throwing sports. Once pain has been reduced, a gradual return to one’s previous level of activity can be expected. Substantial improvement may be noted in as few as one to two Prolotherapy treatments, and the scar tissue from surgery can be avoided. There are other advantages to Prolotherapy over surgery for shoulder instability. Prolotherapy is the only treatment that is designed to help repair the painful area. It involves no cutting, suturing, sewing, or stapling. The patient is also encouraged to exercise while undergoing Prolotherapy, whereas after surgery there are careful limits to activity. Acromioclavicular joint osteoarthritis is a degenerative disease where the articular cartilage lining of the Acromioclavicular joint bones wears out over time. In this condition, there is shoulder instability causing grinding and pain. The shoulder joint is a juncture of three bones, the scapula (shoulder blade), the humerus (upper arm bone), and the clavicle (collarbone). The scapula and the clavicle meet to form the top or roof of the shoulder and is called the acromion. The joint where the acromion and the clavicle join is the Acromioclavicular joint or AC joint. 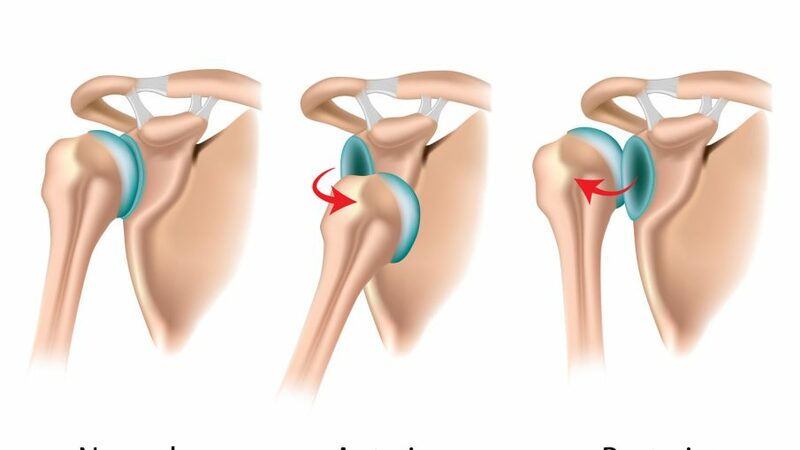 Acromioclavicular (AC) joint osteoarthritis can develop as a result of chronic shoulder dislocation or normal wear and tear in the aging patient with heavy shoulder rotational loads in sports or work. The acromioclavicular joint contribution to your shoulder’s range of motion is to get your arm above your head. It also distributes the weight of the arm to the rest of the body. It is therefore not surprising that weight lifters and wrestlers who frequently lift large amounts of weights have significant incidences of AC joint sprains. Tremendous forces not only injure the AC joint, but are transmitted down the clavicle to the sternoclavicular (SC) joint, which can also be sprained or dislocated. There is a direct correlation between the amount of weight lifted and the weight that is transmitted throughout the AC and SC joints. The greater the weight lifted, the greater the impact throughout the AC joint and, ultimately, the SC joint. During the early stages, AC joint arthrosis usually manifests itself with tenderness and pain in the front of the shoulder around the joint. The pain gets worse when the arm is extended across the chest as this motion compresses the joint, or when lifting. A vague pain may be felt in the shoulder, the neck and the front of the chest. The affected joint may also be disproportionate to the uninjured joint, and may snap or click when used. Typically surgery is not required in acromioclavicular joint dislocation, however there is a debate as to the best method of treatment. “In high-grade injuries, acromioclavicular joint reconstruction procedures may be indicated for functional improvement. There is currently no gold standard for the surgical management of these injuries. The acromioclavicular (AC) joint is one of the unsung heroes of the body. It is formed by the distal clavicle and medial facet of the acromion. (The end of the collar bone and that portion of the shoulder blade that meets to form the point of the shoulder). Interposed in the joint is a fibrocartilaginous disc, and the joint is covered by a capsule. The acromioclavicular joint becomes injured or dislocated when a large force is applied to the acromion when the arm is in an adducted position, for example, during a wrestling takedown or a tackle in football. A fourth ligament – the Coracoacromial Ligament is a strong triangular band which serves to prevent the upward dislocation of the shoulder (glenohumeral) joint. Treating the patient with chronic shoulder dislocation with the “gold” standard of treatments, physical therapy, activity modification, anti-inflammatory medications or cortisone shots has not shown successful. Furthermore, the surgery following the failed conservative treatments fairs no better. This is pointed out by Finnish researchers in the journal Springerplus. The usual treatment for this injury is a figure-eight splint to keep the joint immobile while the healing process occurs. While the initial immobilization may relieve pain, weakening of the ligaments will occur if the immobilization continues indefinitely. Physical therapy and an exercise program may restore strength and function to the shoulder, but the injured ligaments may continue to grind, pop, click and cause pain, especially with overhead activities and when reaching across the chest. Because these activities put strain on the ligaments, the surrounding muscles may go into spasm and become chronically painful, inhibiting the ability of the patient, often an athlete, from using the shoulder normally. Another standard practice is to inject steroids into the shoulder or to prescribe anti-inflammatory medications. However, in the long run, these treatments do more damage than good. Cortisone shots and anti-inflammatory drugs have been shown to produce short-term pain benefit, but both result in long-term loss of function and even more chronic pain by actually inhibiting the healing process of soft tissues and accelerating cartilage degeneration. This is often the case in patients who have had numerous cortisone shots and are eventually recommended to shoulder replacement surgery. However, in our experience, this type of surgery is avoidable. For patients who have already been through any type of shoulder surgery and still having pain or instability symptoms, a consultation outside of a surgeon’s office needs to be considered, particularly with a Prolotherapy specialist to determine instability from ligament failure or laxity. 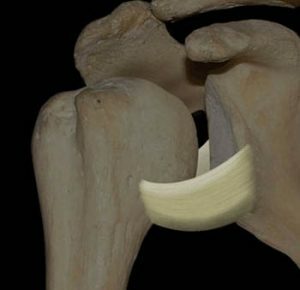 Doctors at the Autonomous University of Barcelona writing in the Journal of orthopaedics and traumatology examined the use of surgery for acromioclavicular joint instability. What they found was a very strong need to pay attention to the shoulder ligaments. “Several surgical strategies for the management of patients with chronic and symptomatic acromioclavicular joint instability have been described. The range of possibilities includes anatomical and non-anatomical techniques, open and arthroscopy-assisted procedures, and biological and synthetic grafts, (for ligament reconstruction). Comprehensive Prolotherapy and a rehabilitation program can strengthen the ligaments and dynamic shoulder stabilizers (rotator cuff muscles). Chronic pain is most commonly due to tendon and ligament weakness or cartilage deterioration, as is the case in acromioclavicular joint syndrome. Prolotherapy is a regenerative injection treatment, which is what degenerated structures need. In our office, the shoulder is one of the most common areas we treat. In addition, we have published scientific articles and studies on our results, this includes shoulder pain, glenoid labrum tears, arthritis and more. When it comes to seeking non-surgical options in the treatment of difficult to treat or chronic shoulder pain, patients frequently find themselves researching our injection treatments of Comprehensive Prolotherapy incorporating various treatments to include Stem Cell Therapy, Platelet Rich Plasma Therapy, and Dextrose Prolotherapy. You can learn about the many shoulder conditions we treat at this starting page for shoulder pain. Research hospital doctors in Spain publishing in The open orthopaedics journal write of the complexities in treating a patient who has multidirectional instability of the shoulder. Complexities include hyperlaxity (very to extremely loose shoulder), anatomical problems, muscle misbalance and possible traumatic incidents in each patient (see our discussion of chronic shoulder dislocations). Patients who do not show a favorable response after 3 months of conservative treatment seem to get no benefit from further physical therapy. When conservative treatment fails, a surgical intervention is warranted. Due to the complex anatomy of the shoulder and the large range of movement of this joint, a wide variety of anatomic injuries and conditions can lead to shoulder instability, specially present in young population. Recognizing and treating all of them including Bankart repair (see below) and capsule-labral plicatures (this is a condition where the soft tissue that lines and holds the shoulder in place becomes excessively loose). While looking at all these possible candidates for shoulder instability, the Spanish team wrote of the difficulties in making these surgeries work. Comment: The warning is that all these things may be happening at once. Below the research finishes with the recognition that if you fix one thing, you may make one of the other problems worse. In published research from Caring Medical doctors, The optimal long-term, symptomatic therapy for chronic shoulder pain has not been established. Accordingly, we investigated the outcomes of patients undergoing Hackett-Hemwall dextrose Prolotherapy treatment for unresolved shoulder pain at a charity clinic in rural Illinois. We studied a sample of 94 patients with an average of 53 months of unresolved shoulder pain that were treated quarterly with Prolotherapy. An average of 20 months following their last Prolotherapy session, patients were contacted and asked numerous questions in regard to their levels of pain and a variety of physical and psychological symptoms, as well as activities of daily living, before and after their last Prolotherapy treatment. The results of this study showed that patients had a statistically significant decline in their level of pain, stiffness, and crunching sensations (crepitation). Prolotherapy, PRP, and Stem Cell Therapy have been used successfully in patients seeking alternatives to rotator cuff surgery. as well as patients with SLAP Lesions and Glenoid Labral Tears. If you have a question about shoulder instability treatment, you can get help and information from our Caring Medical staff.